Measuring, mixing, munching, crunching, dolloping and baking. Cupcakes are wondrous for children to be inspired to take control of what they eat. 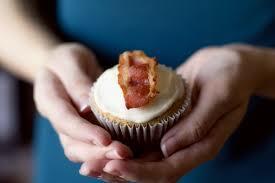 Empower your children make bacon cup cakes. 1. Cook the bacon nice and crisp. Go on and eat a few slices the recipe really calls for 6 slices. Cream the butter, sugar, salt and eggs. Add the remaining Ingredients: with the bacon crumbled in last. Take the cup cake pan and grease it. Dollop the batter in and bake at 350 until a tooth pick come clean. 1. Cook the bacon nice and crisp. Go on and eat 6 more slices. Soften the cram cheese. Mix in a handful of slice scallions, then add the bacon. Top the cupcakes. Have drink and cup cake.